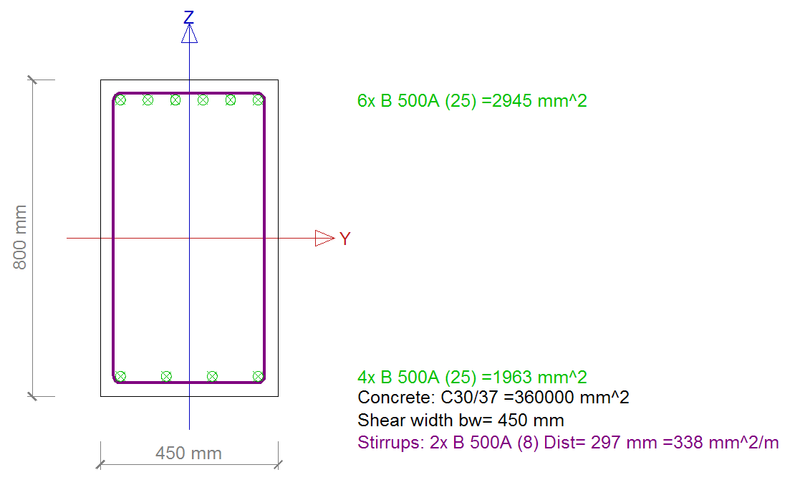 This module is used for design and check of reinforced concrete beams and columns according to code. 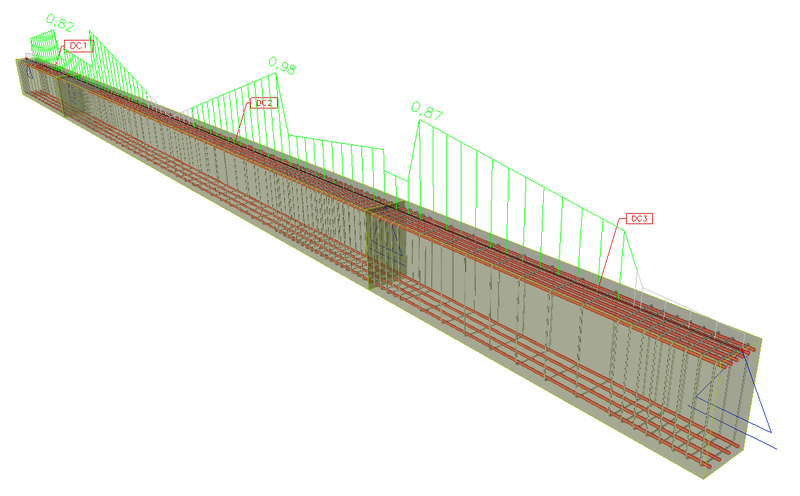 For beams basic reinforcement can be introduced. The program then calculates, if necessary, the additional reinforcement. 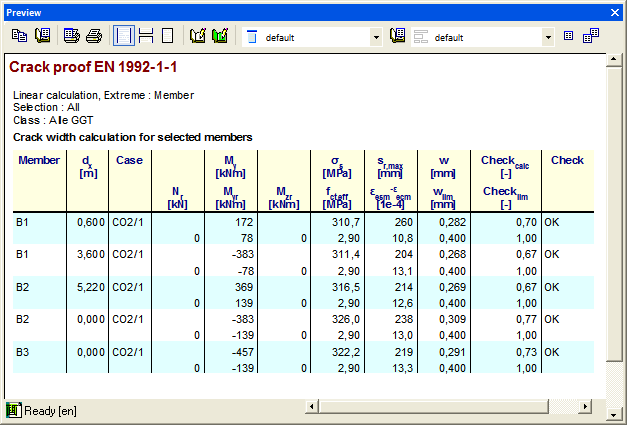 In order to calculate columns, the model column method is implemented. The advantage of this method is that a linear calculation is sufficient for the calculation of reinforcement in columns subjected to bending and axial force and it takes into account second order effects.. A crack analysis in serviceability limit state is also carried out. Longitudinal reinforcement (total reinforcement or basic reinforcement and additional reinforcement), shear reinforcement, reinforcement percentage, weight of reinforcement. The capacity check calculates the extreme allowed interaction between the normal force N and the bending moments My and Mz. 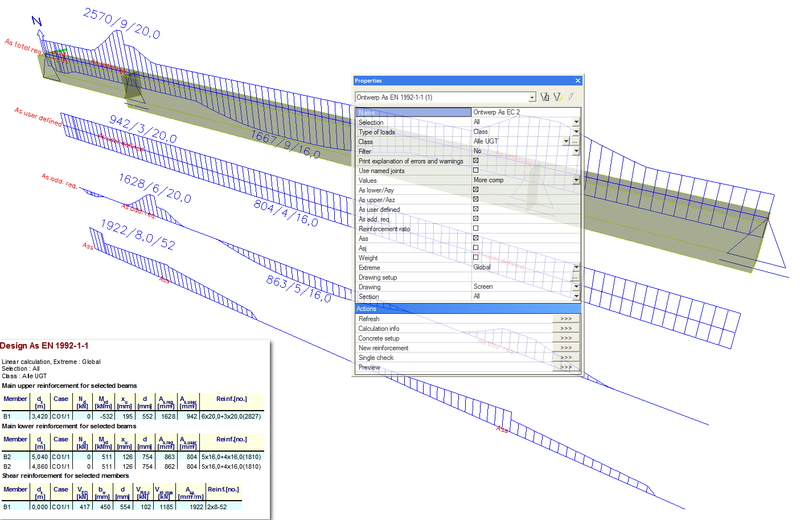 In theory this is a 3D diagram (interaction diagram), but SCIA Engineer allows the user to make horizontal and vertical sections. The axis of the diagram has an axis for the normal force Nx, the bending moment My and the bending moment Mz. The stress/strain check is a completely different method. 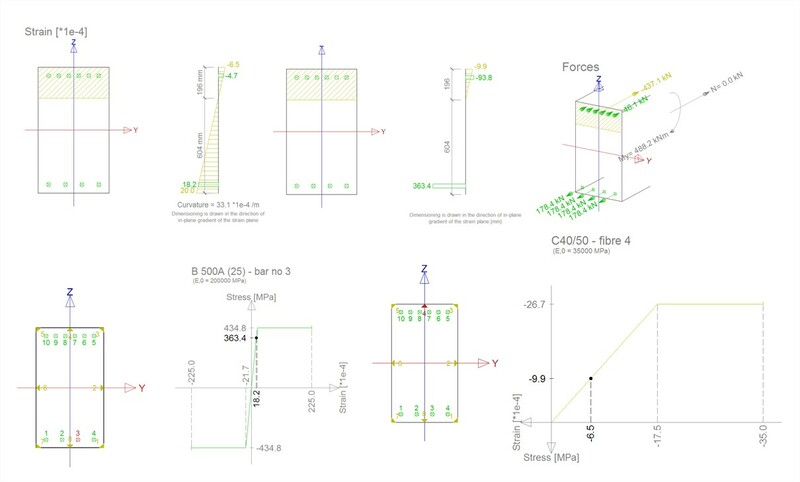 This method uses an iteration routine to calculate an equilibrium, based on the internal forces, the cross section, the material properties and the reinforcement layout. However, this method does not calculate extreme values such as the interaction diagram, but it calculates the state of the equilibrium for that cross-section. The calculation also contains the height of the concrete compression zone, curvatures, stresses, strains and forces. The stress/ strain check works for every interaction of the normal force with uni-axial or bi-axial bending moments. 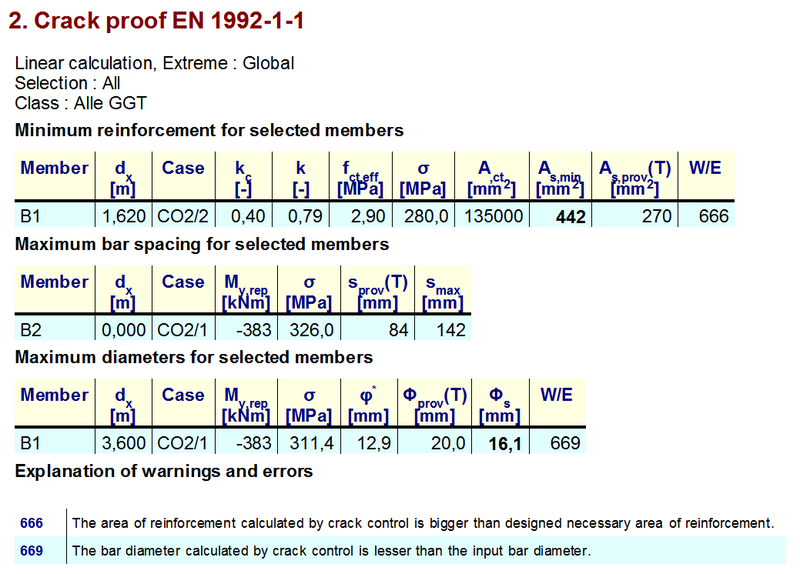 The crack-check for selected serviceability limit state combinations based on the required reinforcement areas can be carried out. The results of this check are the crack width, the minimum area of reinforcement for controlled cracking, the maximum diameter, the maximum bar distance and the maximum spacing between stirrups. The minimum and maximum reinforcement percentages are checked and also the bar distances for longitudinal and shear reinforcement. The user is able to perform more checks in one operation by means of “the overall check”. With this option the user will save a lot of time and clicks and will have a better overview on the overall calculation. The main benefit is that the user is able to perform more checks for all types of concrete 1D elements in one step.